Photo measuring slightly more than 3.25 x 5.25 inches, mounted in a folding cardboard frame/folder. Photographer is Sujarchuk & Plosquer, Foto Arte Moderno, of Bahia Blanca, Argentina. Otherwise undated and unidentified. 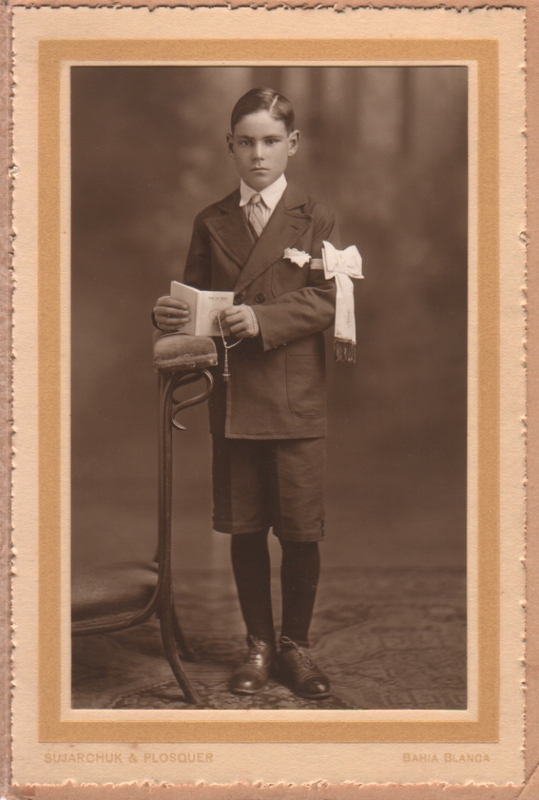 One of my eBay purchases years ago was a group of four First Communion photos. Such photos are fairly common, but what made these a bit unusual (to me) was that they were all from Argentina. They were all boys, different locations, and apparently different decades. But unlike the American First Communion photos I recall seeing, these all showed boys wearing these bow/ribbon things on their left arms. As little as I know about First Communion ceremonies generally, I know nothing about these arm decorations. That said, as a spectator looking at life as shown in photos, I enjoy observing displays of pomp and ritual, even if I don’t know what they mean. (The wedding photos or the Baum photos I’ve posted elsewhere are examples of that.) This is probably my favorite of the four, though I like them all. It’s sweet the way he looks like he’s taking this moment so seriously. I had a surprisingly hard time reading the title of the book, but it seems to be Guia Del Alma, which translates to something like “Guide the Soul” or “Guide for the Soul” or something (any input on that would be welcome). But one thing I noticed when enlarging the scan in an effort to read the book title was that he bites his fingernails. Poor thing, I guess he takes everything so seriously. Young boys when I was growing up wore white suits for their first communion. That identified them on their special day – in addition to having religious symbolism. Since this young man has a regular suit, perhaps the white bow helps distinguish him as a first communicant on an important day in his life. Just a supposition. I have no idea, either, but that suggestion makes sense. All four pictures show boys in dark suits, but they all have these arm decorations. That chair has got one tall back! Indeed it does! I think, though, that rather than a chair for sitting, it may be a sort of portable individual pew. You’d kneel on the lower part and rest your arms on the upper part. Of course, that would be for somebody of more adult proportions than our boy here. I have a picture of a woman kneeling with a prayer book on something that I think is similar. I’ll have to post it in the next few days.